The peppers on the plants that came back from 2017 are ripening and fortunately the rodents don't find most of them to be pleasing to their palates because these plants are just sitting out in the open, totally unprotected. But the DR's aren't easily convinced that the peppers aren't to their liking. I found a lot of Aji Angelos that had had their tips chewed off. Most of those were spoiled but a few like this one were salvageable. I'm not sure why but the DR's didn't sample more than a couple of Aji Goldens. 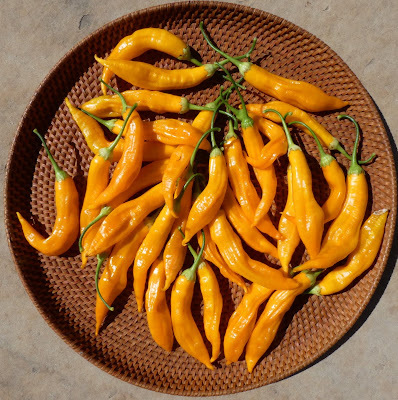 I've got all of the Baby Aji Amarillo peppers fermenting at the moment and after about a week I'll then dehydrate them to make mild pepper flakes. I haven't decided what to do with the rest of the Aji's yet. 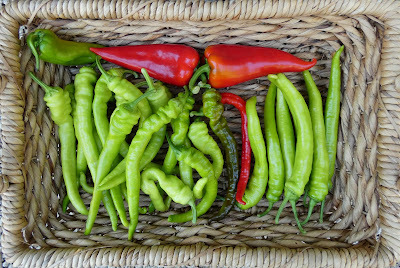 Fort Pepper yielded up a couple of harvests. That bunch of Aji Marchant are undergoing lacto fermentation to make a mild pickle. Mehmet's sweet peppers are good as a frying pepper but rather than frying them on top of the stove I roasted them in a cast iron skillet in the oven. It takes longer in the oven but I like the end result better. I wrote up my method on my recipe blog HERE. I'm experimenting with making lacto fermented pickled beets with some of the Badger Flame beets that I harvested the previous week. They were so pretty sliced up that I had to take a photo which really doesn't do them justice. The Pink Plume celery is doing quite well this year and I'm getting generous cut-and-come-again harvests. The spring sown Orion fennel which produced just so-so bulbs in the summer is sprouting a second round of bulbs and most of the roots have 2 or more shoots so I've been thinning them out. The Short Stuff carrots also needed thinning which produced some pretty nice baby carrots. 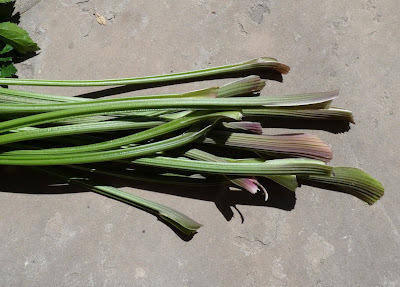 I've been trying to write this post for ages and as I've been going through a big bagful of dried Cilician parsley seed heads to renew my stash of seeds I figured that it's finally time to get the post done. Cilicia was a tiny medieval kingdom in coastal Armenia, an area which is now in Turkey and Syria. The kingdom was in existence from only 1198 to 1375. It is thought that this particular parsley has its origins in medieval Cilicia, however the Cilician parsley that is grown today isn't cultivated in that region anymore. 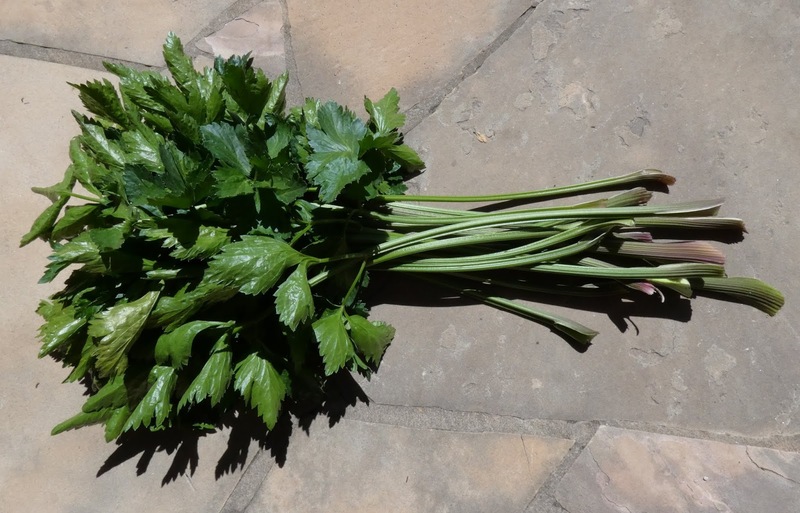 The Cilician parsley that is grown today came from Cyprus. The seeds were brought to the US in 1965 by a Cypriot who settled in Astoria, New York. He obtained his seeds from a relative in Templos which is on the north coast of Cyprus, which lies to the south of the once-upon-a-time coast of Cilicia. Cilicia and Cyprus shared a lot of cultural and political ties in the middle ages and Templos was apparently an innovative agricultural center. 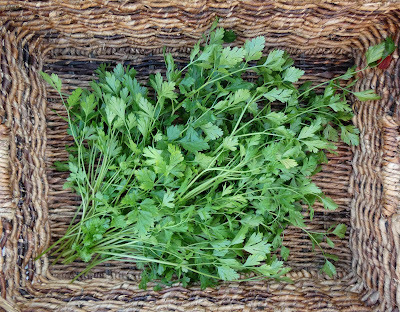 Many Near Eastern foods were introduced to Europe by the order of monks who inhabited the village starting in the early 14th century and the story goes that this unusual parsley from Cilicia was one of the introductions. It's so interesting to me to think of the journey that this herb has made from medieval gardens in the eastern Mediterranean to New York and eventually to my garden in California. 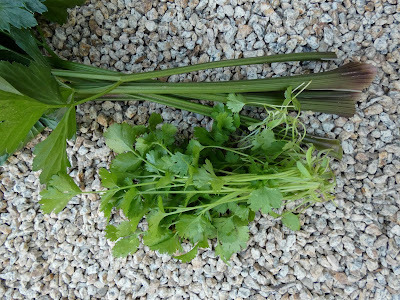 This parsley is a flat leaf variety with a superficial resemblance to the rather less unusual Italian Flat Leaf parsley. Actually, there are a number of flat leaf parsleys available and many of them are not Italian, but that's another story. Cilican parsley stands out in comparison to other flat leaf parsleys that I've grown (including Italian, Turkish, Macedonian, and Einfachschnitt 2). 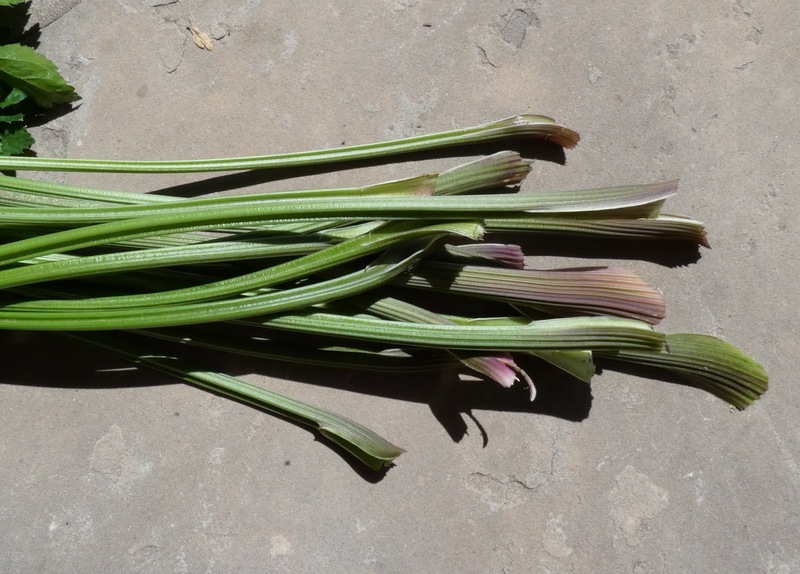 It is noticeably more delicate with overall smaller plants, more delicate leaves and stems, more fern-like cut leaves, and an aromatic complex flavor. I detect hints of nutmeg and think the flavor is less "green" than other parsleys. Cilician parsley will tolerate shade and perhaps prefers it in warmer climates. It is well suited to growing in my mild climate with or without some shade. I have sown seeds from winter through summer with success. The plants resist bolting but a few always seem to so I cull those to be sure that I save seeds from the most resistant plants. 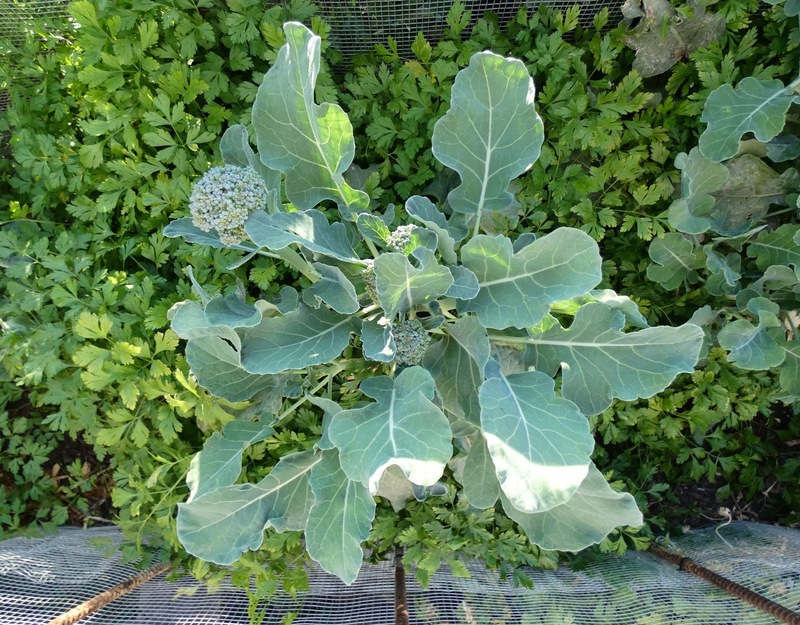 I have found that it makes a good companion planting with long producing sprouting broccoli, the broccoli provides a bit of shade for the parsley and the parsley protects the roots of the broccoli. Winter and spring sown plants can produce for over a year in my mild climate with some attention to harvesting. The plants will decline if allowed to get overgrown but will rebound if they are cut back hard and will respond to a good hard trim a few times through the growing season. But the primary reason why Cilician parsley has become my parsley of choice is that it is hands down the best tasting parsley that I've ever grown. This parsley makes superb parsley centric dishes like Tabbouli or Italian Salsa Verde. I love to use large quantities of it in salads. 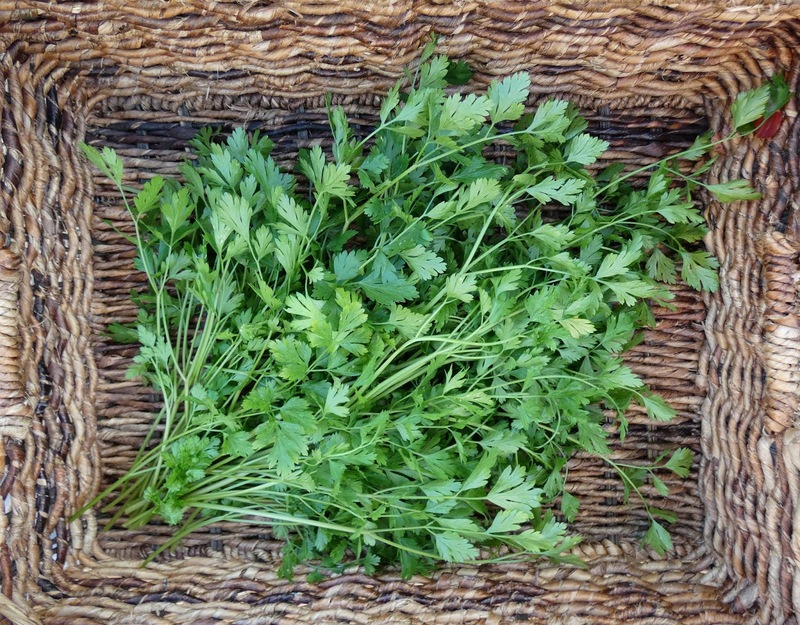 And of course it can be used as you would any other flat leaf parsley. The source for the history of this herb that I've presented here is an article by William Woys Weaver which was published by the Brooklyn Botanic Garden a number of years ago. The article doesn't seem to be available anymore but you can read a transcribed version of it on a forum on davesgarden.com. I highly recommend reading it because I just included some highlights here and the rest of the story is fascinating. It's a shame that this parsley isn't more widely known and grown. 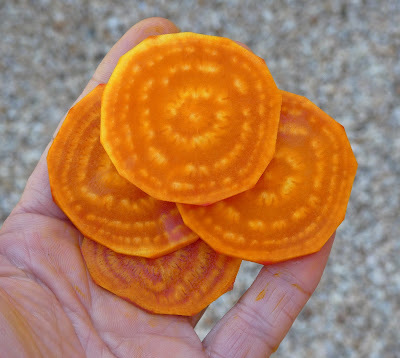 If you are interested in growing Cilician parsley you can find seeds at Adaptive Seeds and I might be persuaded to share a few starter packets from my limited stash. I don't save seeds for this parsley every year because it takes about 18 months to go from sowing to saving. So I hope you will understand that I'm not overly generous because my stash has to last me a few years. My original seeds came from William Woys Weaver through the Seed Savers Exchange but he no longer offers this variety through the exchange and neither does any other member. Doesn't it figure that the minute I say that my elaborate rodent defenses seem to be effective that the damn critters prove me wrong. 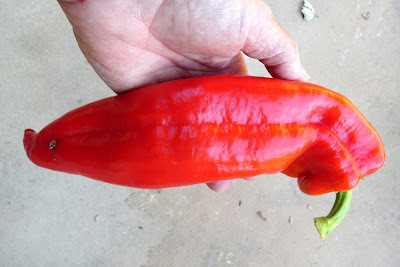 Fort Pepper was breached last week and I lost a couple of pounds of ripe sweet peppers to the effers. Here's what I rescued. 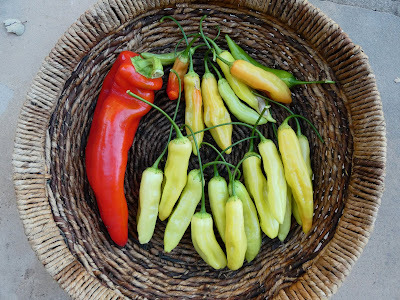 The unripe peppers above are a Gogosar, Turkish Sweet, and Polvadera all accidental harvests that I knocked off the plants. 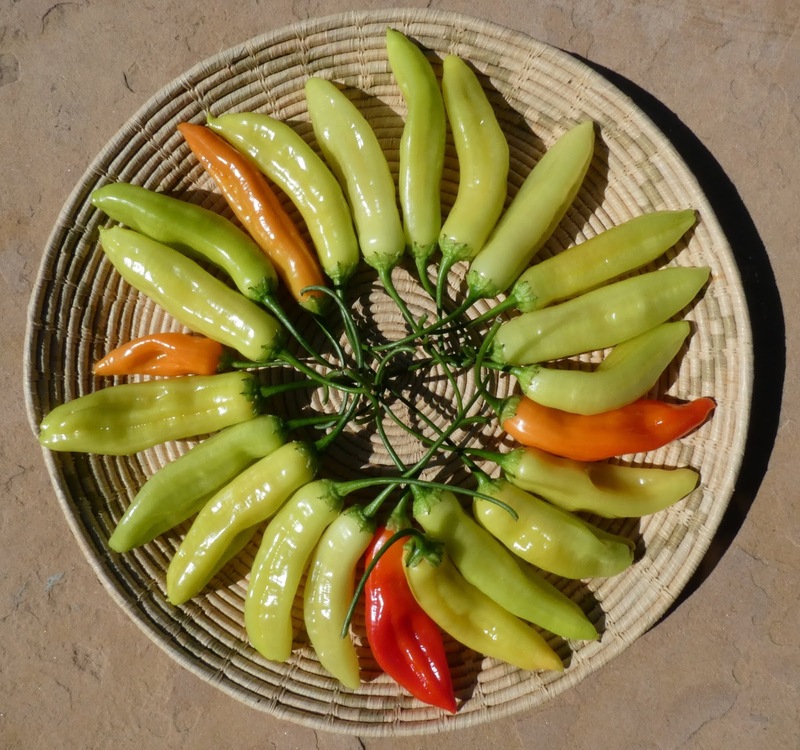 I don't know how the rodents figured out that the Gogosar peppers have the most seeds which is what they are actually after. They chew into the pepper leaving a pile of flaked pepper flesh and then totally clean out the seeds and leave behind an eviscerated pepper pod. They "harvested" twice as many ripe Gogosars than I did. Grrrr. 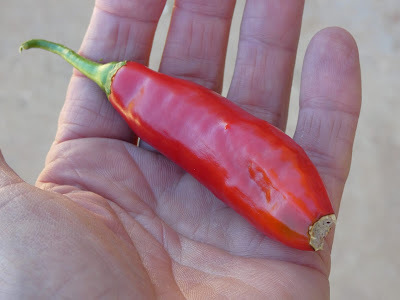 A couple of days before I found the breach I had harvested the first ripe Rosso Dolce da Appendere pepper and a number of Aji Marchant peppers. Aji Marchants are usually harvested underripe and made into pickles. It's a northern adapted baccatum pepper that seems to be quite happy in my cool coastal climate. 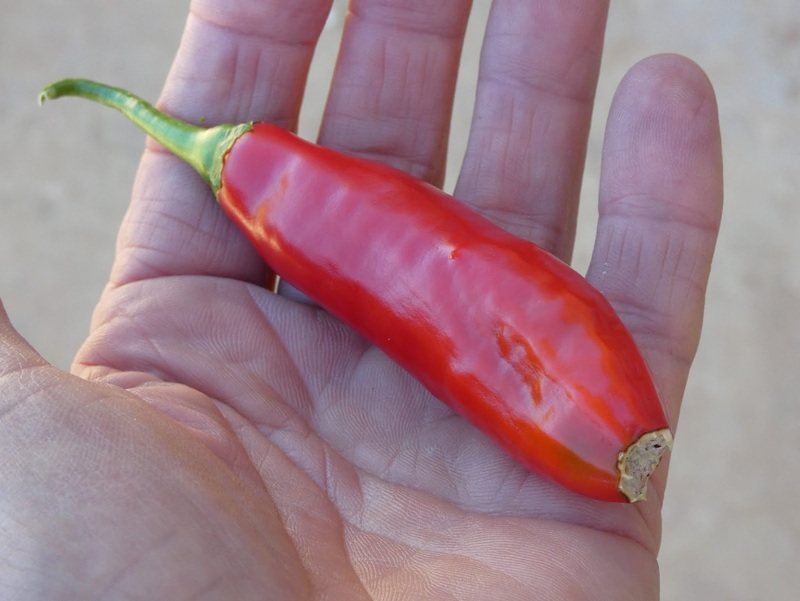 I tried one of the peppers fresh and found it to be sweet and fruity and quite delicious even underripe. I'm looking forward to trying some of them pickled. 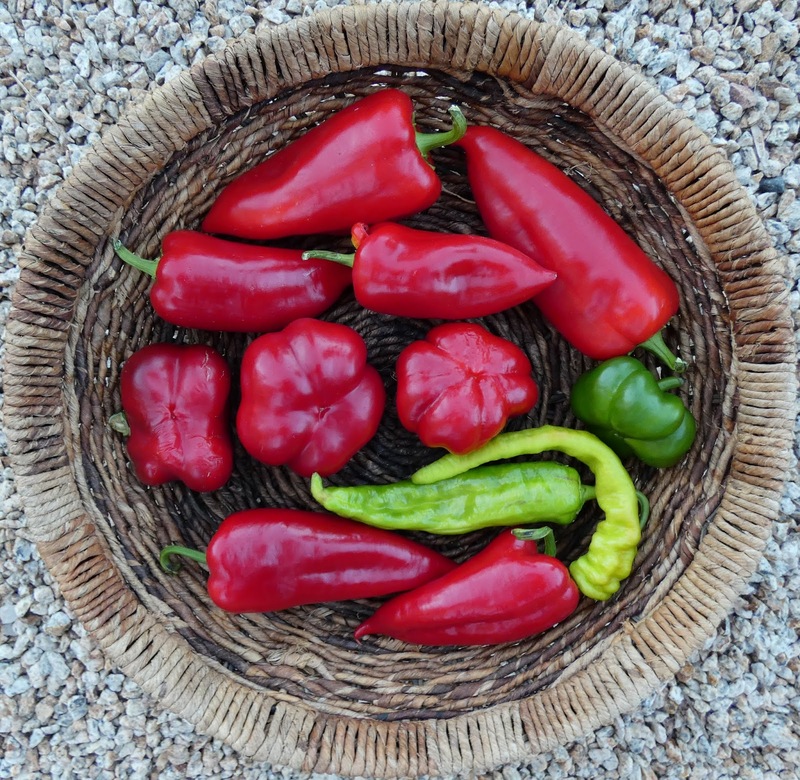 Rosso Dolce da Appendere is a large sweet pepper that is not dense with seeds so the rodents sampled a few pods and moved on to the seedier Gogosar peppers. I cleared out the spring sown (April) Badger Flame beets. The really big ones push their tops out of the soil and the exposed skin becomes scaled and rough but it doesn't effect the quality of the flesh. I discarded the tops because most of them were either infected with powdery mildew or were home to a lot of aphids. Last week Shawn Ann asked what a nematode infected potato looks like so here's a photo. The skin becomes bumpy and looks like it has warts. 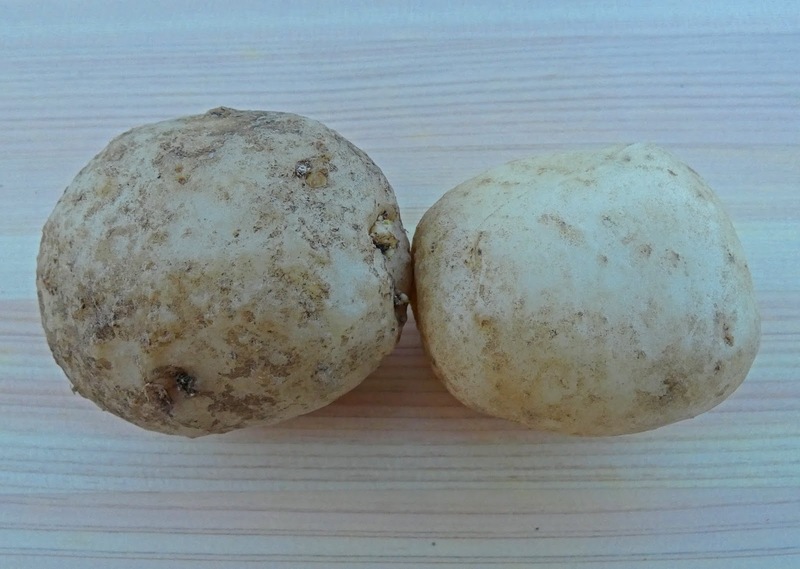 Here's a side-by-side shot of a badly infected potato next ton a more normal potato. You can click on the photo to get a larger view. 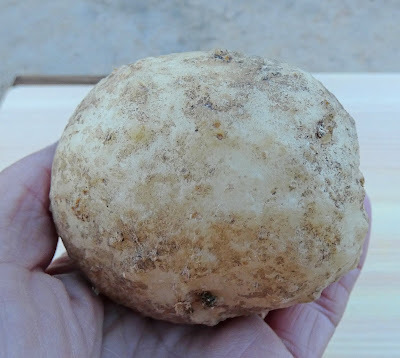 The potatoes are still edible but I do peel off the skin and throw it in the garbage rather than the compost so that I don't infect the compost with nematodes. That's the latest harvests from my rodent infested garden. Harvest Monday is hosted by Dave on his blog Our Happy Acres, head on over there to see what other garden bloggers have been harvesting lately. What a difference a year makes. Last year on September 11 my harvest post featured a parade of tomatoes, a trickle of peppers, plenty of squash, and a few cucumbers. And this year? Well, take a look. Thank goodness rats don't dig for potatoes. I could have dug these back at the beginning of August but didn't have time to deal with them so I turned off the drip lines to that part of the bed and left them in the ground. Upstate Abundance certainly lived up to its name, that basket was part of the 30+ pounds that I dug up on Saturday. With the addition of the early potatoes that I harvested my investment in 1 pound of seed potatoes gave me 34 pounds in return. French Blue Belle potatoes weren't quite as generous, in total I harvested about 28 pounds from 1 pound of seed potatoes. This variety seemed to be more prone to disease and a few of the plants were hit pretty hard by nematodes. 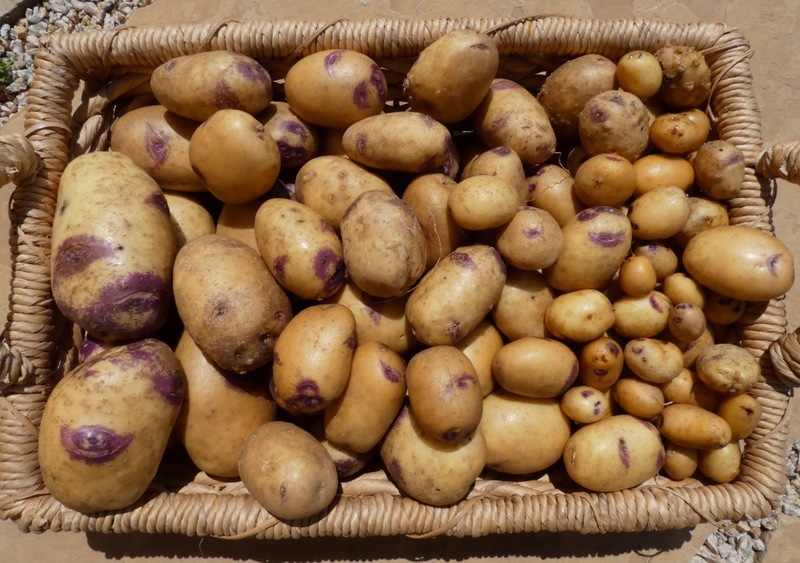 Some of the Upstate Abundance potatoes were infected by nematodes but overall they were healthier than the French Blue Belles. It's a lot of potatoes to deal with and I don't have an optimal place to store them so I'm experimenting with dehydrating some of them. The Baciccia bush beans were just starting to produce when it was time for me to leave for vacation so I harvested everything of reasonable size and got about 2.5 pounds of fresh beans, some of which we enjoyed and the rest went into the freezer. Upon my return the plants were loaded with beans that were swollen with mature and maturing beans. 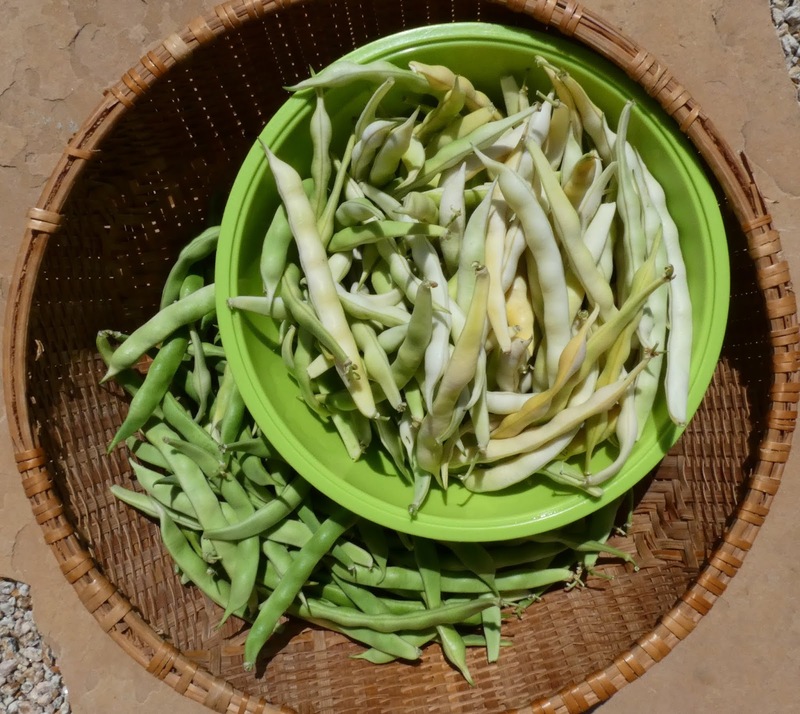 I harvested everything that was on the plants and used most of them as shelling beans. They were better than expected, actually quite tasty, especially since these beans are not intended to be harvested as shelling beans. I've since removed the plants and will try some snap and snow peas in their place. The Pink Plume celery had a growth spurt in my absence so now I'm able to start harvesting it stalk by stalk. I also sowed some cilantro seeds just before I left and it has grown to harvestable size. 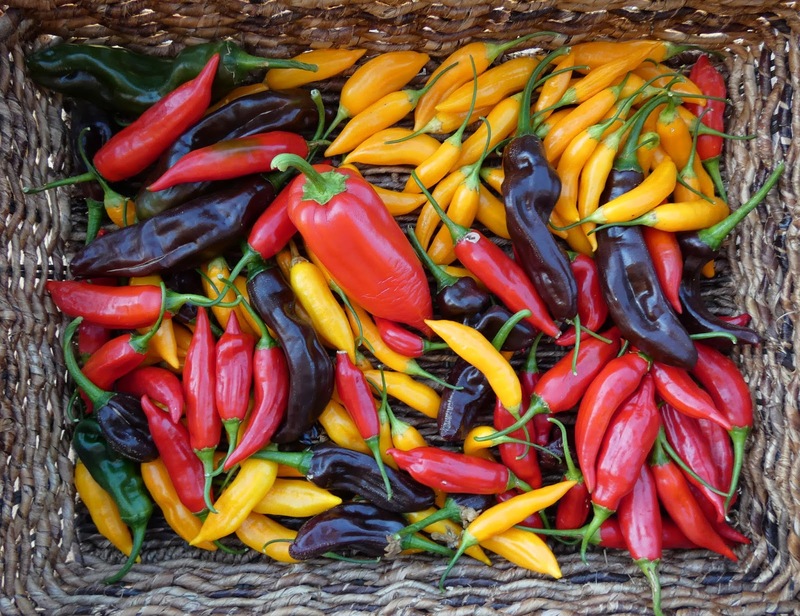 I think the peppers are starting to ripen just on schedule or just a bit late, the first ones are just trickling in. 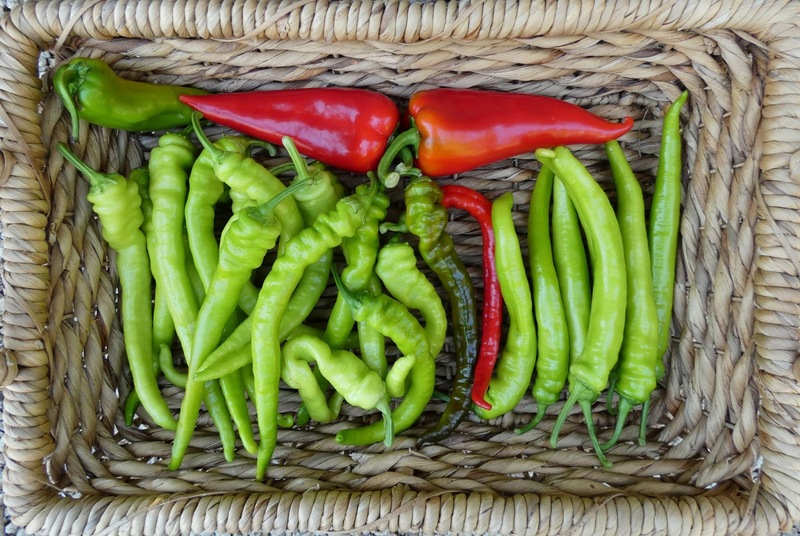 Both varieties of long thin Turkish sweet peppers are excellent eating when green and we've enjoyed the first ones pan fried and roasted or raw in salads. The roasted peppers make a tasty accompaniment to smashed potatoes. Oh, and I didn't photograph the 2 pounds of green Jalapeños that I rescued from the rats. 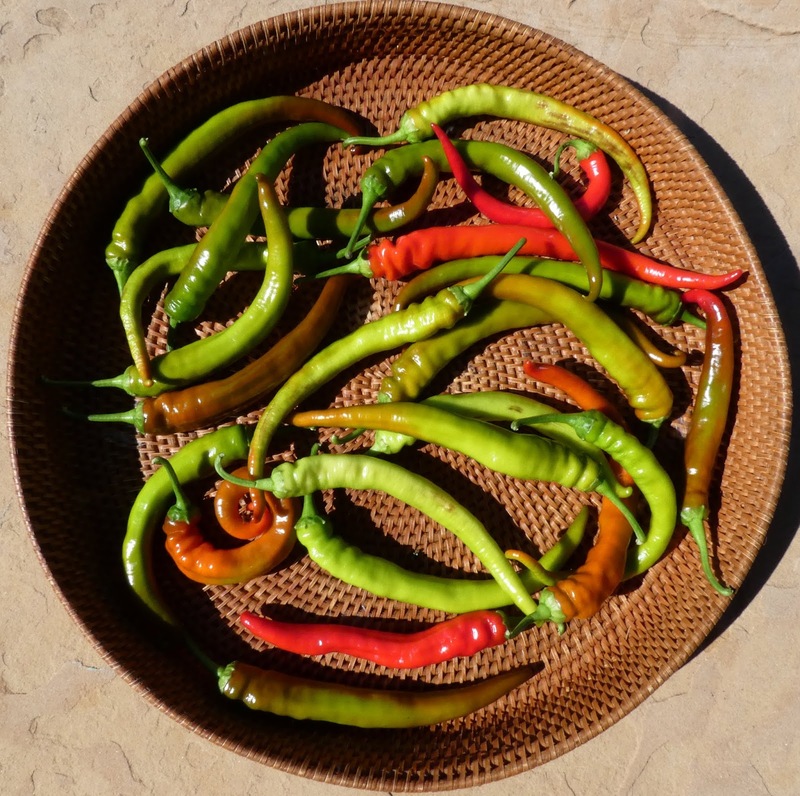 I decided to ferment those to make a green hot sauce. 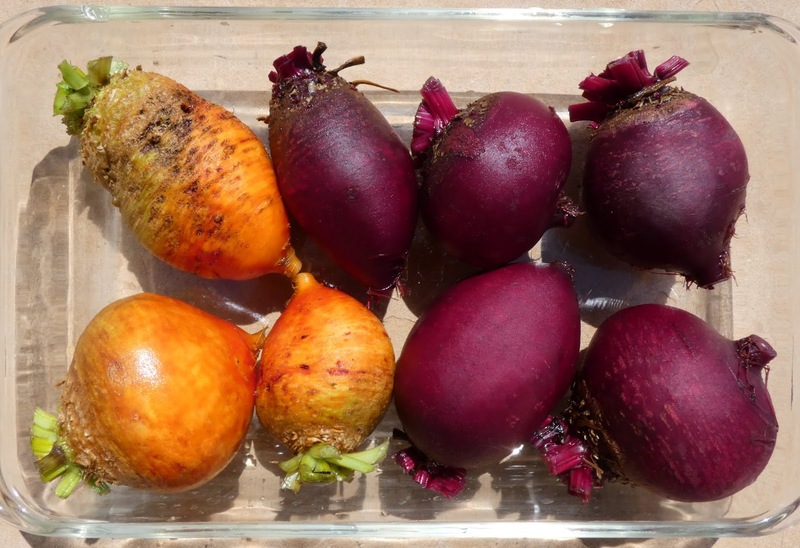 The spring sown beets held well in the garden but it's time to clear them out. I remembered to photograph this harvest just before I popped them in the oven. It's not exactly a bounty of summer veggies but I'll take what I can get. Back on August 6 I secured the veggie garden gate and with mixed feelings of disgust and relief I bade it farewell as Dave and I set off on a 3 1/2 week hiking adventure to Norway and Iceland. Honestly, as we were traipsing the trails I barely gave my garden a thought. Whatever was happening in the garden was beyond my control and was not worth worrying about. Before our departure I had done everything I could to try to deprive the local rodents of an opportunity to feast while I was away. Pretty much everything that pleased their palates was encased in hardware cloth. Other things like squash, cucumbers, and tomatoes which could not be enclosed in rodent resistant cages were relegated to the compost bin. It's hard for me to believe but this is the first summer in years that I'm not harvesting homegrown tomatoes. So it goes. So what did I find upon my return? Let's see. There's a few pepper plants growing that came back from 2017 and those plants aren't protected in any way. Of course the rodents have developed a taste for Jalapeño peppers and have figured out how to eat just the mild flesh and the seeds and leave the spicy core. I got home in time to rescue most of the peppers on one plant and pretty much stripped it of the green peppers but now I have to figure out what to do with the green peppers. I much prefer ripe red Jalapeños but I won't let the green ones go to waste. The rodents are also nibbling at the Aji peppers but so far haven't done much damage. There was a couple of cherry tomato vines behind the pepper plants but the rodents started to eat the tomatoes at the end of July so I ripped out the plants back then. I had been a bit concerned that the broccoli plants would throw up some tall shoots and push open their cage while I was gone, but the rodents dug their way in and took care of trimming all the tender young shoots for me. They didn't manage to completely destroy the plants and now that I've made it more difficult for them to dig their way in I'm hoping that the plants may be able to produce more shoots. 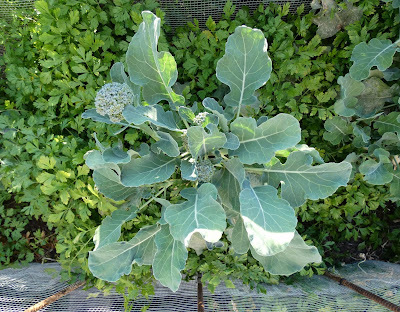 Once the rodents were finished snacking on broccoli they dug their way into the neighboring cage where the Yellow Cabbage collards were growing and ate the tops of the plants which pretty much destroyed the plants so what was left of them is now cooking in the compost bin. After I removed the plants I covered the ground with hardware cloth to keep the boogers from digging back into the broccoli cage. One other thing that the rodents have developed a taste for is Calendula seeds. I know it's not birds because the birds don't gather seed heads and find a nice cozy place to munch and leave behind a pile of eviscerated seed capsules. So that was the worst of it, but as I said I didn't leave much exposed in the garden that they have a taste for. They don't dig for potatoes, celery isn't to their liking, basil is blah to them, parsley is passé, and bolting fennel is too funky. So let's check out the fortress that makes up the rest of my garden. Most notable is the extraordinary defenses that I set up around the pepper patch. I put in 70 plants this year, filling almost an entire bed, and I'm not letting them go down without a fight. I made a number of panels from 3 X 5 foot pieces of concrete remesh to which I attached hardware cloth. Those panels are attached to stakes with cable ties. I made sure that there are no gaps that the beasts can wiggle through. In addition to the panels surrounding the bed I added 2-foot pieces of hardware cloth that juts out from the top of the panels just in case the Damn Rodents try to climb up the fence and into the bed. If they try to climb up and over they will find themselves wedged into a tight space. I made the "fence" fairly easy to disassemble so that if the harvests come on strong I can take the panels down for easier access. In the meantime I can use a couple of step ladders to get into the bed to check on things and do light harvesting. I don't want to get too confidant now but so far Fort Pepper seems to be effective. In the bed on the other side of the main path, other than peppers from last year there's a cage where I have a couple of varieties of beans and a patch of cilantro that I seeded just before I left for vacation. I got my first harvest of Baciccia beans the first week of August and it was enough to enjoy some fresh and freeze some for later. I seeded some Castandel bush green beans at the end of July. Those are doing ok and I'm hoping for fresh beans in October. On the back side of the bed I had been growing a long row of bush dry beans. As you can see the space is now empty but not because I harvested the beans. The rodents found a way into the cage that I had erected to protect the beans and they ate all the flowers and young beans. Those plants fed the compost bin back in July. I just covered the space with cardboard until I got home and just the other day I planted the corner of the bed that you see at the bottom of the photo with saffron bulbs. Most of the rest of the veggie activity in the garden is in the next bed. One end of the bed is planted with 3 Brussels sprouts and 3 kalettes plants. Each plant has it's own protective cylinder of hardware cloth. The rodents haven't taken an interest in Brussels sprouts and kalettes in the past but I'm not taking any chances. The celery was nibbled on back in July but the critters don't seem to have liked it so it's been unmolested since then. That's a good thing because it grows too tall to easily keep covered up. Mature flowering fennel hasn't been targeted by the furry pests but they have munched on young fennel at times so the new plants that I set out are in protective cages. The same goes for the new chard plants. 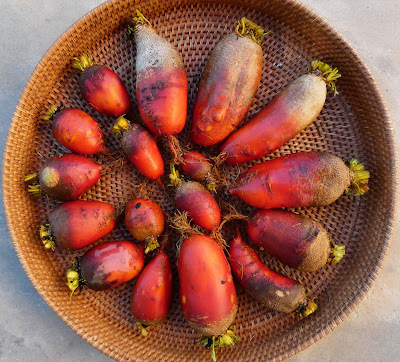 Inside the cage are beets which in the past have been gnawed on, both roots and shoots. 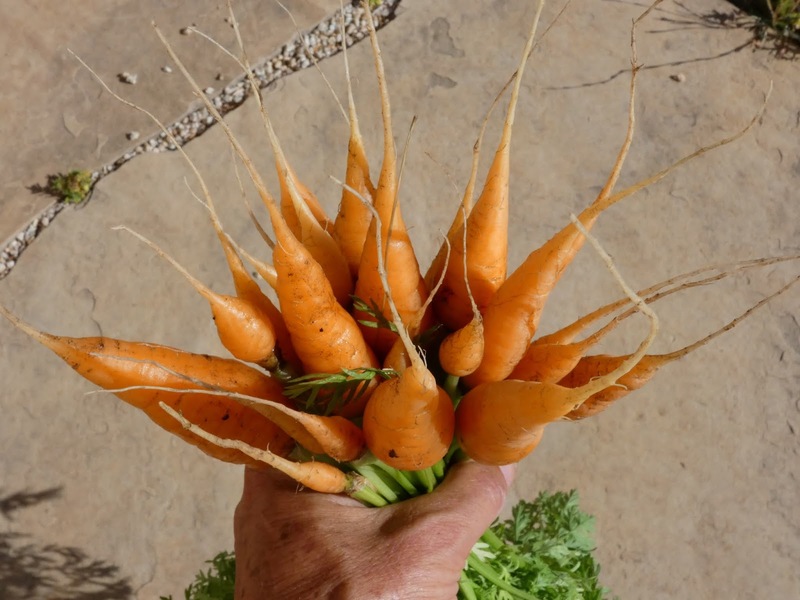 July sown carrots are also under protective cover, rodents like carrot tops. 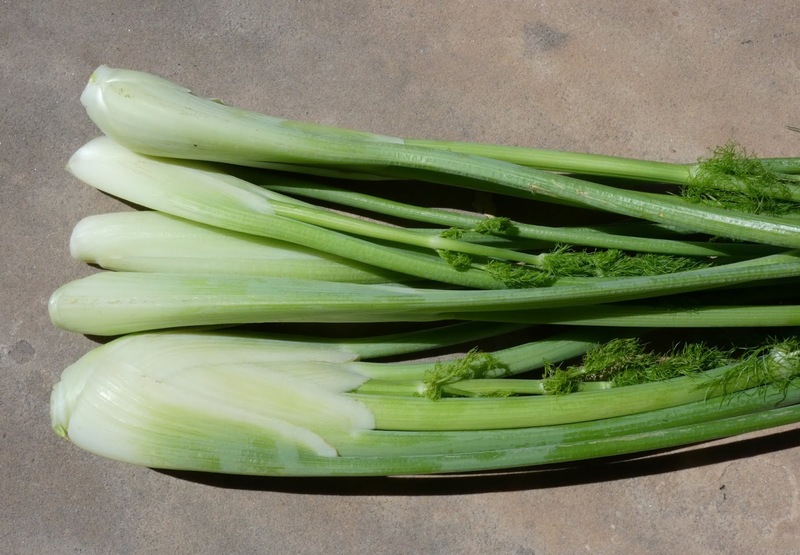 Celery stalks aren't on the rodent menu but they do like celery root (celeriac). And parsnips are easier to grow under cover more to protect young seedlings from intense sun than from predation. The last bed is where I would normally be growing mostly squash, cucumbers, and melons. There aren't any there now. I cut down the Tromba D'Albenga vines before I left for vacation because the rodents were eating the vines and the young squash. The cucumbers were also starting to attract the attention of the rodents and even without that concern there wouldn't have been anything edible on the vines after a month without harvesting so they also fed the compost bin. I wasn't even going to attempt to grow melons because last year the rodents ate all the flowers on the vines. And after my experience withe the Tromba D'Albenga plants this year the winter squash fell off the grow list also. What's left now is basil, parsley, Cilician parsley plants gone to seed, and bolting fennel from which I'm collecting fresh green seeds for culinary use. There's a patch of Upstate Abundance potatoes left that I need to dig. And in this corner where I dug the French Blue Belle potatoes the other day I've sown some Nema-Gone marigolds. 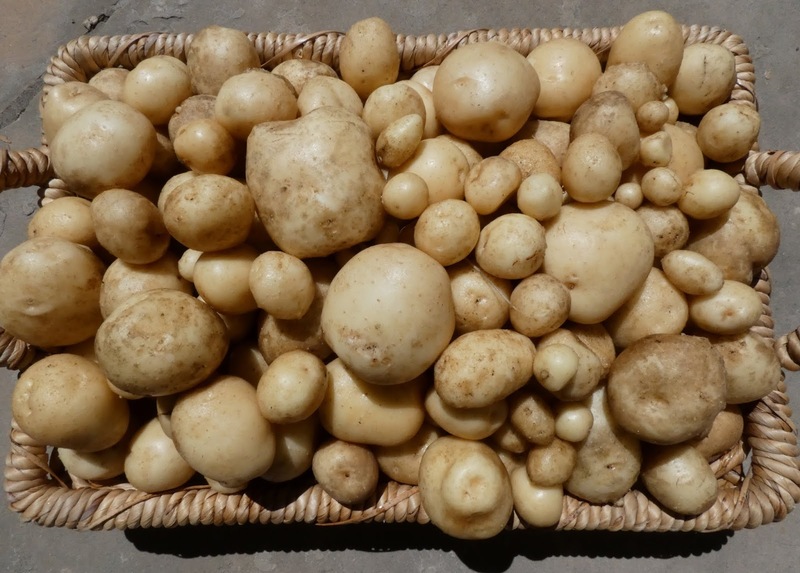 The French Blue Belle potatoes produced a good quantity of potatoes but unfortunately a lot of them were infected with nematodes. So that's the latest in my garden. It's not quite what I would expect at this time of year but I'm grateful to be able to harvest what I can in the face of a seeming plague of rodents. The battle continues, I trapped another rat in the garden just yesterday and I know there's more out there because there was fresh nibbling in the unprotected pepper plants last night. I'm back, I'm refreshed, and I'm inspired to start gardening again in whatever reasonable way I can.